Larry Yes is an artist, songwriter and musician who focuses on positivity, humor and heartfelt emotion. He loves using art to turn strangers into friends. 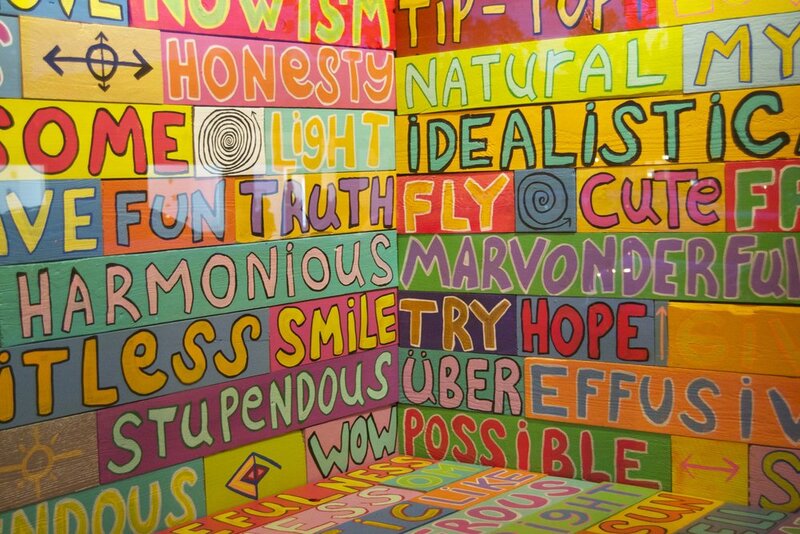 His social engagement projects include Art in the Park, a public party/art therapy session, and Positive Words, a community-sourced installation of uplifting language. His visual art has been shown at PDX Contemporary Art Window Project and the Portland Building, and he has collaborated with Portland Museum of Modern Art. In his nearly 30-year musical career, he has toured Europe, performed with Michael Hurley, Sonny and the Sunsets and Elliot Smith, He describes his current musical style as “positive cosmic folk.” A native Oregonian, he lives in Portland. Caitlin at PDX Contemporary told me I should try for this RACC installation, so I put together a spirited proposal and got the gig. This was surely the biggest and most difficult install to date. All and all it was essentially 23 feet wide by 11 feet tall, plus a whole bunch of little spaces here and there. It was so much fun bringing it into the space. We looked like circus clowns with a never ending parade of Positive Words and we hung it in like 4hours!! It was later pointed out to me that I had misspelled the word surely in my comment book (surly!!!). At first I was bummed, but during an opening I had for thee show, I got up on a ladder and made it right!! Thanx to Keith and William at RACC for being cold chillers!! 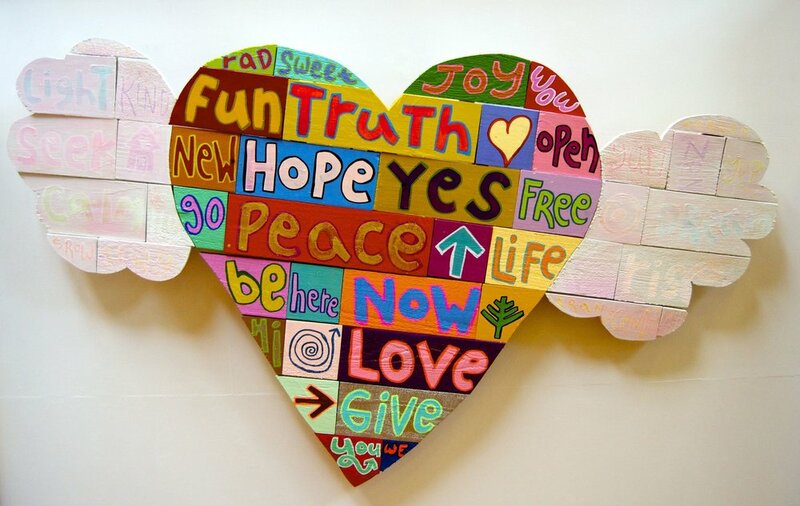 "Radical Positivity" a Portland Building Installation by Larry Yes April 25-May 20 2016 from Larry Peace-Love Yes on Vimeo. 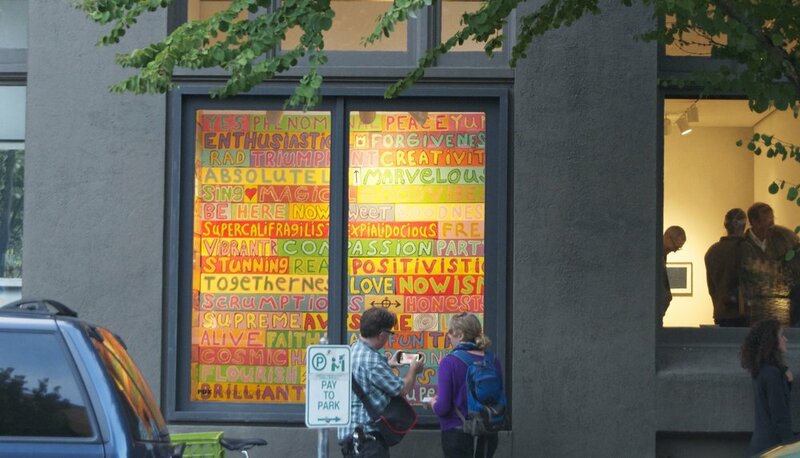 Now I really wanted to build a room of Positive Words and somehow luckily I got the opportunity to do a window project at PDX Contemporary. Thanks to Vanessa Renwick for making this happen!! It was a real treat and a lot of good vibes. I measured the space many times but I got it!! My only regret is that I didn't make a ceiling!! Next time!! The heart was born out of need and the mountain was a moment of inspiration. I was lucky enough to be invited to come hang some work and collaborate with Katie Sullivan's art class at Reynolds High School. I had just finished thee heart and had a stack of words that I brought to the school. I showed my plan to thee students and they did all the work!! It was a great time and a true pleasure to work with these artists of tomorrow! 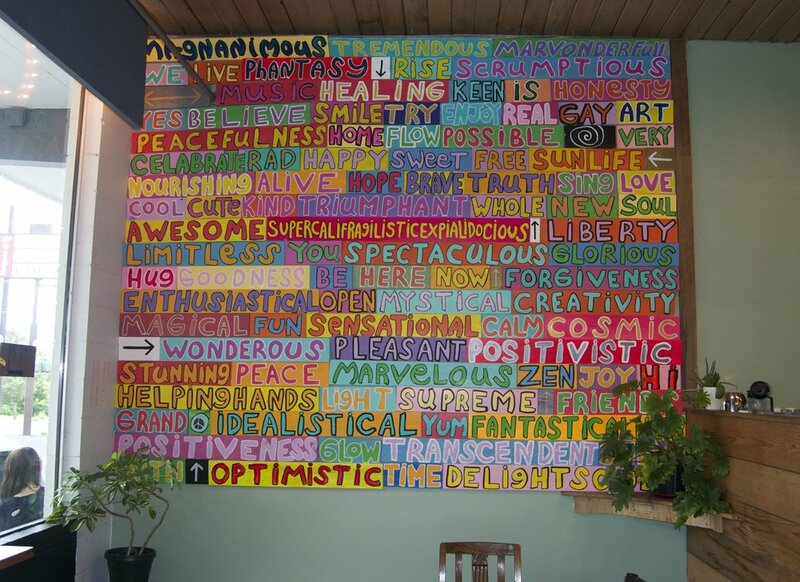 Right after making the first series of Positive Words at Cherry Sprout, there was a realization of the desire to see thee words hanging together with no gap in color and to fit perfectly.ish on a wall. Just then, Libby, the coffee delivery/art curator from Marigold, invited me to hang a wall. It was thee beginning of a new realm for Positive Words and "108 Positive Words" was born. I brought my little baby for the installation and it was a full circle or goodness and mayhem. I learned so much from that process and it was a true joy!